A largely peaceful demonstration in Chile to honour the victims of General Augusto Pinochet's military government has ended in violence. Some 3,500 people took part in the march to Santiago's General Cemetery. 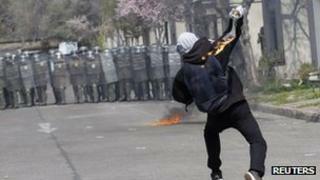 Chilean police say small groups of masked protesters attacked a government building and looted shops. Eight people were arrested. Police used tear gas and water cannon to disperse about 100 protesters who built barricades and lit fires. The march was held as Chile prepares to remember the military coup that deposed the elected socialist president, Salvador Allende, on 11 September 1973. Many of those taking part carried pictures of family members who died or disappeared during the Pinochet government, from 1973 to 1990. Police said the vast majority had marched peacefully but that masked demonstrators had once again tried to disrupt the event and damage property. Human rights organisations say more than 3,000 people, including opposition politicians, were killed during General Pinochet's 17-year-long government. Some 30,000 people were imprisoned and tortured. General Pinochet died in 2006 without being convicted of the crimes.